I’m going to switch gears from the usual format for movie reviews and do a serious one. 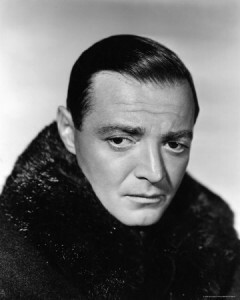 M stars Peter Lorre as child murderer Hans Beckert. We meet Beckert as he lures Elsie Beckmann away as she leaves school for lunch. He appears first in silhouette against a wanted poster seeking the child killer that has been active in the area – Beckert himself. 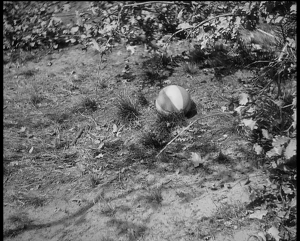 His exchange with Elsie is interleaved with scenes of Elsie’s worried mother calling for her, and concludes with the stark images of Elsie’s ball rolling out from behind a hedge and the balloon that Beckert bought for her blowing away. The imagery is powerful – without showing a drop of blood we know what has happened, and we can feel the sense of dread and unease that permeates the city. Lang goes down an interesting path with M. It isn’t so much a mystery – we know Beckert is the killer within the first few minutes – as it is a study in how the city reacts to the crimes. The citizens, fearful for their children, begin to accuse others – even an old man who tells a young girl the time of day. Beckert, meanwhile, taunts the authorities by sending handwritten notes to the newspapers, assuring the populace that he isn’t finished. The police, unable to determine the identity of the killer even with the (then) new technique of fingerprinting, have turned to brute force searches and random shakedowns of the seedy areas of the city, trucking dozens of people to the precinct house in a futile effort to ensnare the killer. The criminal bosses, facing increased scrutiny from the police and a general downturn in business as a result of the murders agree to their own scheme to find the killer, by employing the town’s beggars to run an ad-hoc surveillance network looking for anyone suspicious. The police begin to zero in on Beckert when they investigate recently released mental patients, and connect him to the crimes by his cigarettes, which are the same brand found at the scene of a previous unsolved murder. 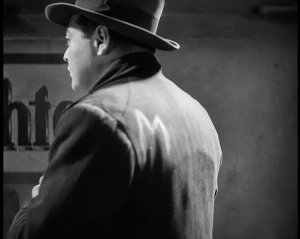 The beggar patrol marks Beckert with the letter M on his coat, and trails him through town, ultimately trapping him in an office building when it closes for the day when he inadvertently gets locked in the attic by one of the building’s watchmen. The crime bosses break into the building and restrain the watchmen, and begin searching for Beckert in order to bring him to (their brand) of justice. When one of the searching criminals hears Beckert trying to open the attic door, he alerts the others, and in the excitement one of the watchmen is able to trip the building alarm that will bring the police. 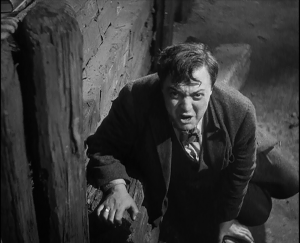 The criminals storm the attic and capture Beckert moments before the police arrive, and carry him out to put him “on trial”. One of the criminals is trapped in the building and captured by the police, who eventually discover the location of the “court”. Beckert is brought before the assembled criminal population of the city in the basement of an abandoned distillery, where he is subjected to a kangaroo court. During his trial, Beckert breaks down, admitting to his crimes but claiming that he simply can’t help himself – that he’s compelled to kill – and doesn’t remember the murders. He gets no sympathy from the “court”, who prepares to carry out their death sentence but are interrupted by the arrival of the police. The film closes with Beckert’s real trial about to get underway, and Elsie’s mother, still in mourning, crying that the children must be protected. M works in large part due to the final act. Some of the criminals who are sitting in judgment of Beckert are themselves guilty of murder. None are completely innocent, yet the nature of Beckert’s crimes are such that he is an abomination even to them, and they fear that the legitimate court system may eventually let Beckert back into society where he will kill again. Beckert’s pleas for mercy and justice ring hollow set against the loss of the families whose children he has killer. The themes here are still resonant today. For a film that’s nearly 80 years old, M has held up well. It’s certainly not as graphic as modern films, and the depictions of life circa 1931 Germany don’t match up with life in the United States in 2009, but those aren’t flaws. It’s definitely worth a viewing, and in fact can be viewed for free online at the Internet Archive. 1The crimes of Peter Kürten make for some fascinating, yet disturbing, reading. The Wikipedia article gives some good links. If you’re interested in such subject matter, I encourage you to look into the Kürten case more closely. 2Beckert whistles Edvard Grieg’s In the Hall of the Mountain King frequently during the film, and it’s now stuck in my head. Lang’s association of the music to the character is an early example of the use of leitmotif in film, and is very effective here.